In Morocco, mint tea is everywhere - you can't pay a visit to this beautiful country without experiencing it's copious tea culture. Served strong, sweet and steaming this tea is the centre of hospitality, negotiations, celebrations and socialising, and most importantly it's not to be drunk in a rush. There are a few ways to make this tea but we've put together Hassan's 5 simple steps to take you through the tea making process - so you can sit back, relax and enjoy a moroccan mint tea in the comfort of your own home. Quick Fact: There is in fact tea and caffeine in Moroccan mint tea! Although it may seem like it’s all mint, proper Moroccan tea must be made with Gunpowder Pearl green tea. First, you will need to fill up your teapot with water, leaving a little space at the top to add in the gunpowder tea. You can take a rough measurement of two rounded tablespoons for a one-litre capacity pot, but you can use more or less depending on how strong or weak you want it. For this teapot for three people, we used two teaspoons of tea. Place the teapot on a low heat and wait for the tea to simmer and for bubbles to appear on the top amongst the tea - this can take a few minutes. Clean a small handful of mint and shake off any excess water - whilst the teapot is off the heat, add the mint into the pot, snapping it in two or folding over, leaving the main stem attached. After the mint, next is the sugar - you can add into the teapot your desired amount of sugar. Traditionally, Moroccan mint tea is normally very sweet with a generous amount of sugar. Once you have the sugar and mint in the teapot then the mixing process can begin. This is the fun part - it's time to get pouring! Take a glass and pour the tea out, then pour it back into the teapot. Repeat this process until you are happy with the taste. This pouring process is an essential mixing and infusion process, helping to mix in the sugar and infuse all your ingredients together to make one delicious cup of mint tea. For your final pour, lift the glass an arms-length above the glass, and pour, this will create the iconic foamy top on the tea. Then, simply relax and enjoy your freshly brewed Moroccan mint tea! 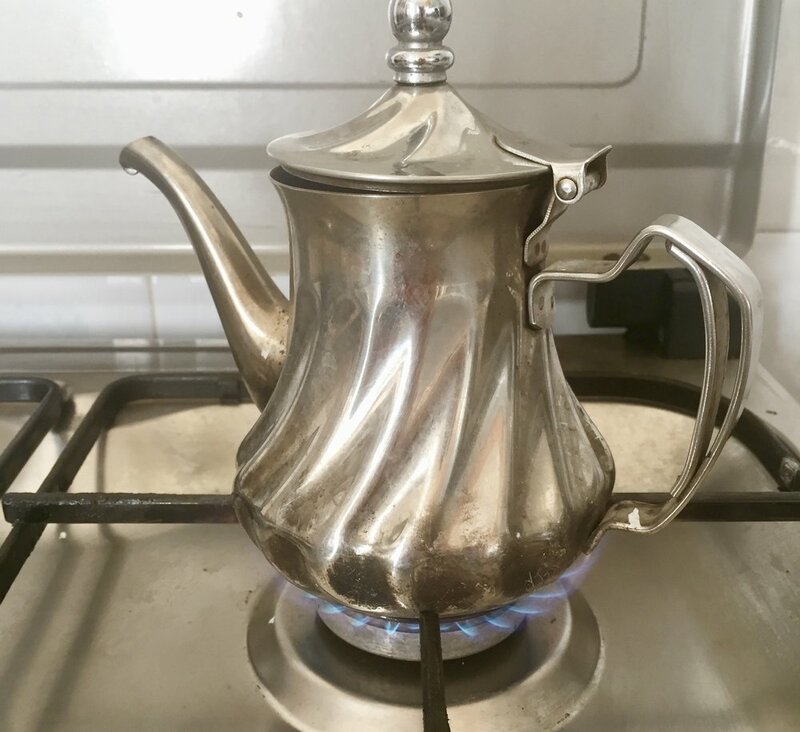 Caution: If you are using a traditional Moroccan teapot be careful when pouring as the handle can get extremely hot!